Phallus indusiatus is a fungus which can be known under several common names, but I know it as the veiled lady mushroom. It is a stinkhorn fungus which has a small cap with a ridiculous looking net-like structure (indusium) growing downwards from the edges. There are several theories as to what this structure is for, but it is not known for certain. 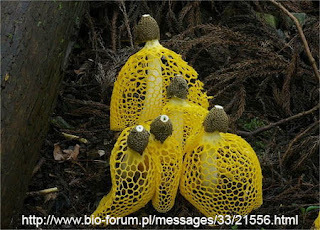 It may not look like the type of mushroom you can eat, but it is edible and in fact is commonly eaten in parts of China. It emits a foul odor to attract flies and other scavenging insects. 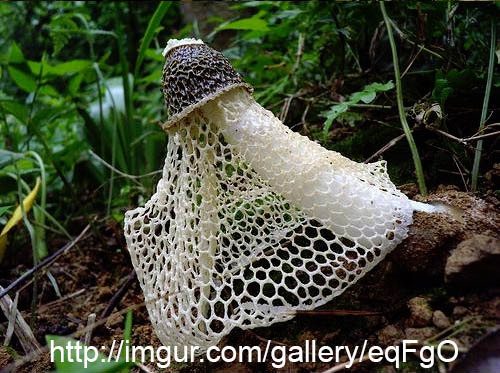 Once the flies come in contact with the mushroom a spore filled slime sticks to them and if spread by the fly to a different area. Phallus indusiatus has a pantropical distribution.